EXCLUSIVE! SET NEWS REPORT! SPOILER ALERT! Actor, writer, and comedian, Tom Green, finished production on his new show called, “Go For The Green!” for Discovery Planet Green. The show wrapped filming last Thursday at Hollywood Center Studios. The set consisted of at least one mentioned recyclable material, as Tom Green stated, recycled sewage pipes (circles seen on the side set walls). The game show is an educational yet a fun way of learning about the factors that are causing concern for our environment. The show begins with a large pool of approximately 50 contestants who stand in a green circle, center stage. 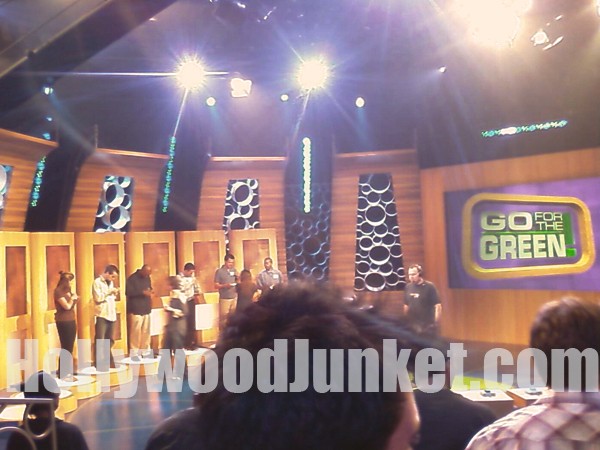 After Tom Green’s introduction, the contestants wait for their cue from him to “go for the green!” after he asks the first multiple choice question. Contestants who answer choice “A” run to the green side of the sitting area (couch bleachers). Contestants with “B” choice answer, run to the blue side of the sitting area (also couch bleachers). Once at the couch bleachers (also used for audience sitting), Green continues his questions in order to whittle the crowd down to 6-8 players. If more players are left with correct answers, they ascend to podiums with buzzers where they answer a final question. All trivia questions are related to the environment. After the players are selected through process of elimination, the second round, the “Green Light Round”, starts. In this round, contestants challenge each other for a place in the final two spots where the grand prize is an exotic, eco-friendly trip. If selected with a random green light, the chosen contestant must either answer the question, or “challenge” an opponent with the question. If the contestant answers the question themselves and gets it correct, they can send an opponent to go home. If they answer it wrong, then they go home. If their opponent answers it wrong, the opponent goes home. If the opponents answers correctly, the contestant that challenged them goes home. The two contestants that remain at end of the round, move on to the third and final round where they play for the trip. In the final round, each contestant must place in chronological order, big picture cards that represent occurrences related to green events, people or inventions. The contestant to achieve the most correct answers in the less amount of time, wins the trip! Some of the trips included: Cancun, Mexico; the Grand Canyon; Bangkok, Thailand; and Hawaii. Tom Green has a fun, audience interactive part of the show called, “The Big $10 Money Game”. Green joins the audience seating area to quiz them on more green trivia. They win $10 cash for correct answers. Sometimes, Green will give wrong responses $10 depending on the content of the question. Because the show doesn’t actually give away any money, I’m guessing the producers and Tom Green decided to add this portion of the game in. It also gives those people who were in the original pool of 50 people a chance to go home with something. Even if it is just $10. Luckily, Tom Green fits-in perfectly into his show. Because it’s his show. It could have been awkward, I mean Green as a game show host. 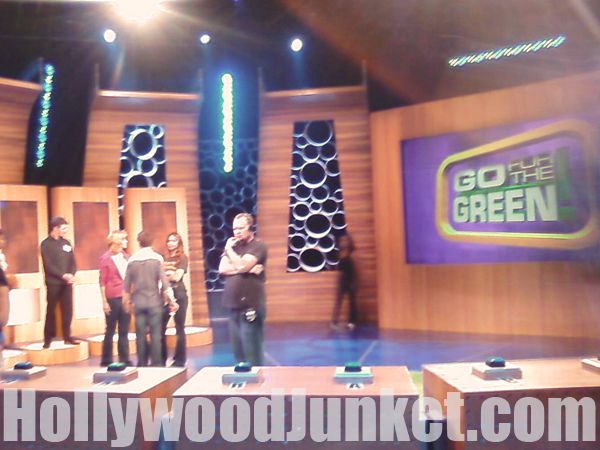 But, the format of the show allows Green to comfortably be himself and still be a great host. I predict we’ll be viewing more than just one season of this show on Planet Green.